There’s a great episode of the always-excellent podcast Decoder Ring about the most maligned of all automotive accessories: TruckNutz. If you don’t know what they are, neither ask nor Google it. The hidden truth is that Americans of a certain ilk — the easiest shorthand might be “redneck,” but I prefer “faux-country” — are all too happy to laugh at themselves, as long as the satire is more absurd than aggressive. 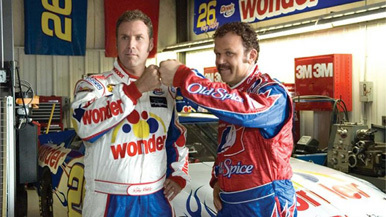 If that’s the case, than the strong box office of “Talladega Nights: The Ballad of Ricky Bobby” makes perfect sense; it’s a pointed parody of southern sprawl and NASCAR culture, but one which seems to honor its target as much as lampoon it. Will Ferrell’s big-screen reputation was still growing, shakily, in 2006. Sure, “Elf” was a massive hit, but his more adult comedies produced modest box-office results; neither “Old School” nor “Anchorman” hit the $100 million mark, both benefiting greatly from the growing ubiquity of DVD players in early-’00s dorm rooms. Even after “Anchorman,” Ferrell spent 2005 on a string of misses; “Kicking and Screaming” barely cracked $50 million, “Bewitched” didn’t do much better and “The Producers” was a commercial disaster. A year later, though, the right combination of a hungry cast, subject and star made “Talladega Nights: The Ballad of Ricky Bobby” a massive hit. John C. Reilly, whose previous bout of recognition had been a string of more dramatic turns in 2002 (“The Hours,” “Gangs of New York” and the sad-sack husband in “Chicago”), was itching to show off his comedy chops. Sacha Baron Cohen was months away from lighting the world on fire with “Borat.” Amy Adams and Jane Lynch were not yet heavyweights; Michael Clarke Duncan needed a reinvention. And a deep well of comedy power hitters, including Rob Riggle and Jack McBrayer, fought for recognition in every scene. The absurdities of NASCAR were also ripe for parody, from the ubiquity of advertising (it doesn’t seem at all absurd when Ricky sells the rights to his windshield to Fig Newtons) to the awkwardness of post-race interviews. And while he can certainly play an elf or a self-obsessed newscaster, Ferrell is at his best as an absurd amplification of the everyman — a person who certainly could exist somewhere below the Mason-Dixon line.